At the Essendon Kids, we are inspired by the Reggio Emilia philosophy. We believe that learning is a lifelong process in which the children, parents, teachers and the environment all play an important role in the child’s life. We acknowledge the importance of play and that it is essential to every area of children’s development and to their health, well-being and happiness. We believe that play provides a fundamental learning process for children, allowing them to expand their skills, knowledge and understanding of the world. Educators at Essendon Kids believe it is important to create a safe, welcoming and stimulating learning environment to encourage thoughtful play. Respect and value the individual backgrounds, unique culture and customs of families. We believe building genuine reciprocal relationships between children, families and educators that are strengthened and sustained over time. Children are offered the opportunity to explore, experiment, learn, develop, help, watch, and lead in their own way and in their own time. This is facilitated by a team of committed Educators who focus on providing learning within a nurturing, supportive, secure and loving environment. We aim to develop the “whole” child by providing the widest possible range of choice and experience and by individualising opportunities to reflect each child’s personality and interests. 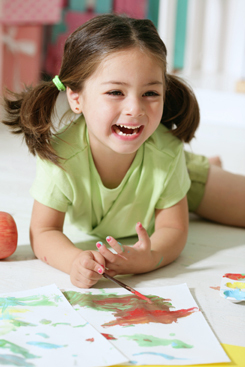 Our curriculum is an emergent curriculum and is one that builds upon the interests of children. Topics for study are captured from the talk of children, through community or family events, as well as the known interests of children (puddles, shadow, dinosaurs, etc.). Educators work plan together to formulate the possible directions of a project, the materials needed, and possible parent and/or community support and involvement. have equal access to all areas of the program regardless of race, gender, ability, age, physical appearance, social status or family structure.